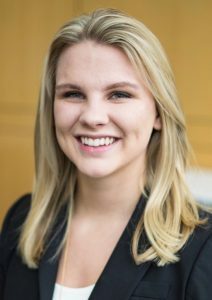 FMI Junior Scholar Peyton Pawlusiak has been awarded one of three national scholarships by Phi Chi Theta, a coeducational professional fraternity in business and economics. The organization provides opportunities to develop and practice professional leadership skills and abilities necessary to succeed in the business community. The 2017 winner of the Anna D. Hall/Helen D. Snow Memorial Scholarship, Peyton was selected based on her contributions to MSU’s Epsilon Phi chapter, scholastic achievement and rigor of studies, school and community activities, and letters of recommendation. In addition to serving on the fraternity’s Pledge Executive Board and as its Professional Chair (2016) and Pledge Class Vice President (2015), Peyton is a founding member of Spectrum Consulting Group, Inc. and a Gold Award scout mentor for the Girl Scouts of Southeastern Michigan. She has had internships with AbbVie and BP Integrated Supply and Trading both in Chicago.